WANT A PEACEFUL HOME? This practical, effective guide for parents with kids of all ages introduces proven principles for overcoming the stress and anxiety of parenting, forged in the personal trenches of countless Screamfree families. Now is your chance to join thousands of other parents in a movement of calmer parenting. The new, revised edition includes updated practical applications of the foundational Screamfree principles, a new chapter on parenting in the digital age, and a comprehensive Q&A section dealing with everything from behavioral problems to allowances and chores. A peaceful home is closer than you think. HAL RUNKEL is one of the world’s most trusted resources for life improvement. His practical wisdom on relationships, conflict, and leadership helps thousands of people around the world enjoy calmer, happier lives. A Licensed Marriage and Family Therapist, registered conflict mediator, and internationally acclaimed speaker, Hal is the New York Times bestselling author of ScreamFree Parenting, ScreamFree Marriage and Choose Your Own Adulthood. He lives with his wife, Jenny, and their two launching adults, Hannah and Brandon, just outside Atlanta, Georgia. “Whew! What a relief—a fresh approach to parenting that eliminates the battles, the bickering, the frustrations and guilt while allowing children the space to learn and grow. It’s inventive and doable…parents stay calm, connected, and in control—a miracle. 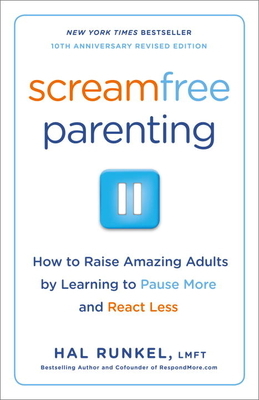 In Screamfree Parenting Hal Runkel gives you the tools to take care of yourself so you can take better care of your growing children. Every parent needs this book—it changes how you think about parenting…and how you parent. You’ll wonder why you ever raised your voice or broke a promise.” --Susan Newman, Ph.D., author of Little Things Long Remembered: Making Your Children Feel Special Every Day.